We have developed a wide range of cardiovascular testing in our office, all producing reliable answers to our diagnostic questions. 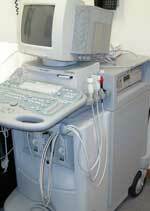 In 2004, we named our collection of diagnostic equipment as the Physicians Cardiovascular Imaging Center. The Nuclear Imaging program incorporates the work of Dr. Thomas Watters, a specialist in the field of nuclear cardiac imaging. Nuclear imaging of the heart is extremely useful in managing coronary artery disease. The technique allows us to determine if the heart is getting sufficient blood flow during stress. A resting scan is compared with a stress scan to determine if defects are reversible, distinguishing prior scar (heart attack) from ischemia (blood starved heart muscle). Based on this information we can determine if additional diagnostic measures are required, such as cardiac catheterization. If an important coronary narrowing is identified, we can proceed with coronary angioplasty. Patients having this study in our office should look at our instruction sheet. (Click here for PDF format). Echocardiography has become an essential in the diagnosis of cardiac disease. We use this computer-driven ultrasound information to give us structural information about the heart...size, thickness, heart valve appearance, abnormal connections from one chamber another. In addition, we get useful pressure (hemodynamic) information. Recently, we have expanded our use for this machine and we can now look at carotid arteries for signs of atherosclerosis. 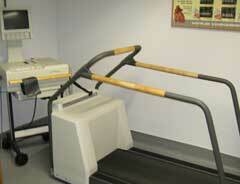 Our treadmill has be helping us evaluate patients for many years. 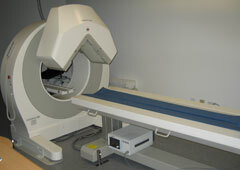 We use it in conjunction with thallium imaging and with echocardiography to put a work load on the heart.